AdSense's "Ads by Google" Link Replaced By "AdChoices"
You might have observed this latest discovery that that Google Adsense Icon label "Ads by Google" changed to "AdChoices" . Previously in unexpanded form "Ads by Google" was often shortened by the letter "i" but the same "i" was replaced with a triangular label icon. Google had announced about these latest development on Adsense Blog . 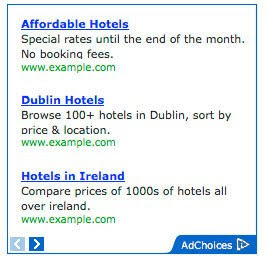 According to Google this change is made only to more proactively give users notice and choice about the ads they see. I personally think that the arrow icon will encourage users to visit the Ads more because of our natural habit of following the arrow direction. I know this would sound funny but couldn't they use a better icon? :p The Icon for me personally looks dull and bore in appearance. What do you think about this latest change? Do you think this can increase our average CTR? I would love to hear from you. Peace. Yes saw this. Can you please tell me how do you always get an image ad next to your title and never text ad? friend i want to share something.. with this update .. New thing also happened. now when i open my site in mobile web or opera mini then i can see the google adsense in my site, Previously this was not like this.. This has increased my CTR with 4 %. thatz a worry for me.. Please view this share for your blog. Actually like your web sites particulars! Undoubtedly a wonderful supply of knowledge that's extremely helpful. Keep it up to hold publishing and that i’m gonna proceed reading by way of! Cheers. My website 'www.techdotmatrix.com' still shows Google ads with 'i' and 'x' icon, instead of 'Adchoices' option. Please let me know how I can show the 'Adchoices' options.